Posted January 18th, 2005 by Ms. Jen & filed under photos + text from the road. Fifteen minutes ago or so, the digital temperature sign at the Wells Fargo building on Main St next to the Main Place Mall reported the temp as 98 degrees. My bank is now reporting 66 degrees. It feels like mid-70s. Posted January 17th, 2005 by Ms. Jen & filed under nature + environment, photos + text from the road. 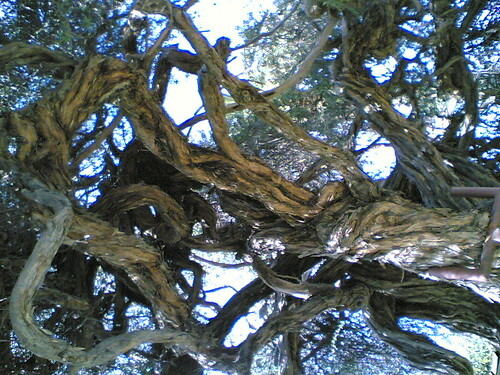 Mon 01.17.05 – Looking up into the canopy of the old olive tree. 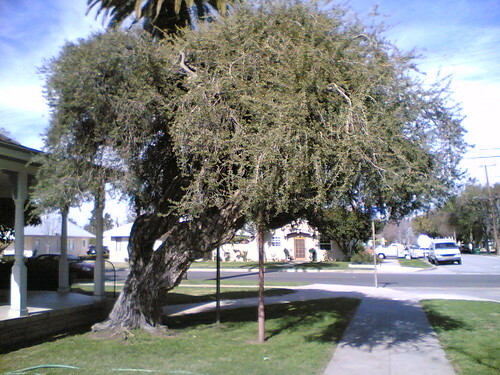 Mon 01.17.05 – A gnarled, leaning olive tree in my neighborhood. Posted January 16th, 2005 by Ms. Jen & filed under nature + environment. I love sycamore trees. The older they get the more whimisical and turn-y their branches grow. The best sycamores are the big, big ones that have grown old near (dry) stream banks and flood plains. These sycamores are in Hart Park and were most likely planted in the 1930s when the park was developed, even though they have been pruned badly a couple of times, they are still grand trees. Photographed by my Nokia 7610 this afternoon. Posted January 15th, 2005 by Ms. Jen & filed under news + events. 1) I am coming down with a cold / flu / cough / headache / foggy head and I am sitting here taking $ from stoned reggae fans at Alex’s door. Lots of the folk expect to the be on the guest list, when they are not. 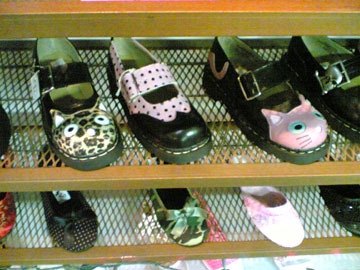 They are really on my Pest List. I keep wondering where their enterprenurial spirit is? Shouldn’t really cheap stoners be growing certain things hydroponically, selling such things, and then they would have the $ to pay five peasely dollars. So the next cheap dufus who demands that they are on the list when they are not, I will offer to let them in for free if I can take their pic and get their real name and post both here. How cheap are they? 2) It has been a long week. A long week made good by the re-emergence of the sun. I can actually walk across the backyard without leaving deep footprints. 3) Last Sunday afternoon, in the downpour, Erika and I went to the Huntington Library for the last day of “The Bible and the People” exhibition. It was an interesting day. The show was ok, most of what was presented was the physical evidence of much what I had learned as a Biola student or in the history of graphic design. The best and worst part of the day were outside of the show. 4) Worst part, first… I leave the exhibition to use the ladies room in the lobby of the building, when a very sleek, expensive, aristocractic woman walked into the restroom ahead of me. She opened up and checked out every stall before choosing the handicap stall. I went into one of the middle stalls. I as I was doing my potty business, she moved into the stall next to me and started using a very loud vibrating machine of some sort. The noise went back and forth. I was appalled, finished up quickly, washed my hands and ran out. As I got out to the lobby, the noise of the vibrating machine (you know what it was) was reverberating and growing louder as echoed through the marble lobby. HELLO! Hello! Hello! What is up with the Pasadena / San Marino aristocrats? Hello! Either at home or get a silent model. Hello! Simply not classy. 5) Best part of the Huntington is the parking lot aisle names. Not Eyore or Tinkerbell or Ariel, but plant names like Cactus 2. 6) A continuing thorn in my side is Honda’s lack of bell or warning sound when one leaves one’s lights on. I told myself driving all the way up from Orange in the heavy rain to remember to turn my lights off when I got out. Did I? No, in the daylight, even if cloudy, I can’t see that the lights are on. When I returned to my car at nearly 6pm, in the dark, in the heavy rain. No battery power. Damned Honda. If California is going to have a law that one’s lights are to be during the day during the rain, then Honda needs to have a warning sound when one has left one’s lights on. Posted January 14th, 2005 by Ms. Jen & filed under art + photography. Thurs. 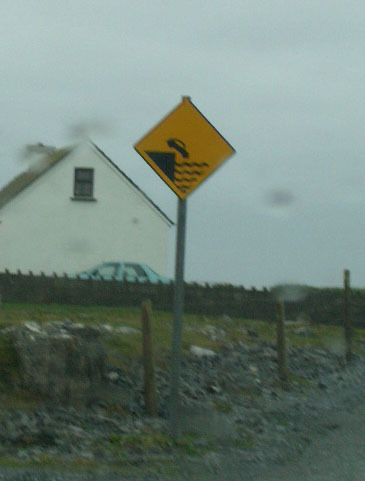 Nov. 25, 2004 – A sign near the pier in Doolin, Co. Clare, Ireland. Posted January 13th, 2005 by Ms. Jen & filed under photos + text from the road. Thurs. 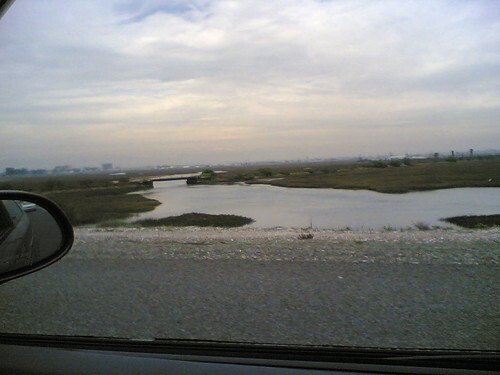 01.13.05 – Anaheim Bay with a snow covered Mt. Baldy (barely visible in pic) in the distance, as I am driving north on PCH. Out of Beta, Into Prime Time – Wasabi! Posted January 13th, 2005 by Ms. Jen & filed under moleskine to mobile. I am participating in a collaborative group mo/pho-blog – Wasabi – that uses Nokia 7610s or Nokia 6670s camera phones and Nokia’s LifeBlog software to post directly to a Typepad blog from the phone. We have been beta testing the phones, LifeBlog, and Wasabi for a month now, until Charlie took off the password protection and launched us! Go check Wasabi out. I have been having a blast posting directly to the blog from my phone using the LifeBlog on the phone, as it is much easier than using Flickr or Mfop2. How so? In LifeBlog, I can view and rotate the photos, add metadata, and make a blog post in Lifeblog, and best of all “mark” up to four photos for upload to the blog at the same time. Once I push send, there it goes. When I view the blog from my phone’s browser or from a computer, Lifeblog has already formatted the photos into a table of thumbnails. Now, how about LifeBlog for MT?